Shine on. The PUMA ONE gets an absolutely gorgeous metallic makeover as Antoine Griezmann looks set to reignite La Liga once again this season. We’ve been treated to some absolutely stunning football boots this season. With adidas launching their incredible “Ocean Storm” pack, Nike unleashing the “Lock In, Let Loose” collection and countless other brands releasing fantastic pieces of footwear- it’s fair to say that footballers may be just a little bit spoilt for choice this season. When they were first released earlier in the summer, the PUMA ONE proved to be one of the most popular designs on the market. Sporting an eye-catching white, black and red colourway, the original boots took the world by storm as soon as they were unleashed, and we’ve already seen them on football pitches all over Europe this season. Due to their popularity, it’s no secret that the entire footballing world has been absolutely pining for some kind of follow-up. With the biggest summer collections from Nike, adidas and New Balance already relaunching in alternate colourways, we’ve all been keen to see exactly what kind of makeover the PUMA ONE would receive. Well, instead of opting for the usual route of relaunching with a secondary colourway, Puma have well and truly jumped in at the deep end by unveiling a limited edition version of the boot. With Atletico Madrid superstar Antoine Griezmann at the forefront of the reveal, the PUMA ONE is now available in a stunning chrome finish. The metallic cloak stands in stark contrast to the original design of the boot, and we have to say that we absolutely love what Puma have come up with. The PUMA ONE Chrome Edition gives players all they need to shimmer and sparkle on the football pitch, turning them into the centre of attention and providing them with the confidence necessary to compete at the very highest level. In short, these boots can only really be pulled off by the most creative and flamboyant players on the planet, and we perhaps wouldn’t recommend rocking up in these if you play centre-half for a Sunday League team. Specifically engineered for enhanced fit and comfort, the PUMA ONE Chrome Edition ensures wearers can utilise pace and agility to skip past defenders. The boots feature Puma’s innovative evoKNIT sock to make sure that players are guaranteed a snug fit, while the lightweight outsole enhances their explosive pace. With a synthetic upper coming in to replace the previous leather design of the original, this special edition of the PUMA ONE is a masterpiece that collaborates stunning, iconic visuals with the best football boot technology around. 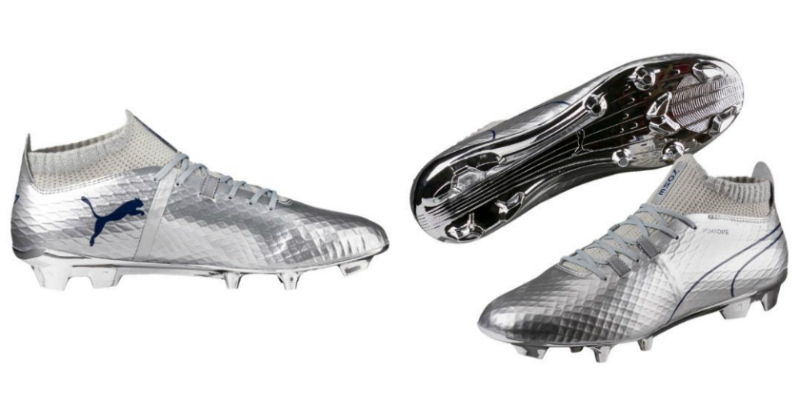 We’re big fans of this robotic chrome-look here at FOOTY.COM, and we can’t wait to see if Griezmann will be taking to the field in a pair of his own. What do you guys think? Are the new PUMA ONE boots a work of art or do you think they look ridiculous? Let us know! But if they do tickle your pickle and you’re interested in finding the best deals on football boots, then browse our collection today to compare prices with the biggest online retailers!